We ship out everyday, US Priority Mail. Available as mohair limited edition….or plush, less expensive and still fabulous. questions, send more pictures, etc. We ship out everyday. More pictures to come………. Saturday Sept 29 11:00 to 2:00 Come Early and Stay Late! Teddy and George Always a Good Example. We put tables out in Front! 50% OFF. Steiff , Hansa, Books, Dolls, Gifts, Miniatures, Cards, Holiday, Bargain Bags, and More. I just updated the SHOP with some gifts for Mother’s Day, Graduation and Father’s Day. Tea Party in the Window. Pictures of the Window…….to follow. 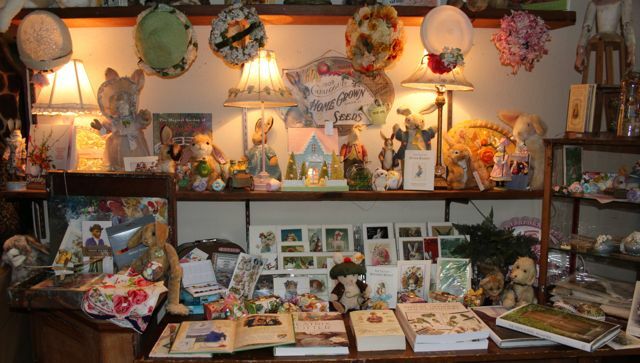 Antique Tea Cups, Tea, A Waving Queen Elizabeth, A Toy Corgi and more. We hope to see YOU soon!